The T-1154 was the standard radio transmitter installation in W.W.II Lancaster bombers. Frequency range 200 kHz, 500kHz, 2.35MHz, 2.5MHz, 3MHz, 8MHz, 10MHz. Output power 50-80 Watts. Requires 1200 V @200ma, 6VDC @4A. Carbon granule microphone with push-to-talk switch, available in metal or black plastic, for use with BC-1306, GRC-9, and other radio sets. Includes cord with PL-68 Plug. The Telefunken ELK-639 Receiver was made in Germany during 1969-1970 and used by the NAVY. Made for Fixed or Mobile applications. Frequency range is from 9.8 KHz to 30 MHz and is divided into two separate groups. Group one is from 9.8 KHz to 570 KHz in five ranges and group two from 250 kHz to 30 MHz in 10 ranges. Modes of operation are A1, a2, A3 and A4 (for facsimile) also the modes of operation F1, F4 and F6. Has a built in loudspeaker. The receiver allows the attachment of 4 different antennas and operates from 110 and 220 VAC 50-60Hz and with 21-31 VDC External power supply for mobile applications. The Telefunken ELK-639 Communications Receiver is available Grade 3 Untested / Repairable. The field telephone set type J is a light weight 2 wire portable telephone set built into a metal case, the top of which can be closed without interference with the the instrument inside. 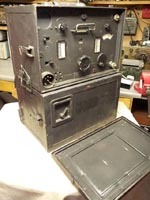 It was used by British Army for field communication. The Telephone set J operates by batteries which are no longer available. Built in hand generator to ring the other phone. Supplied in good condition but untested as we don't have batteries. Manpack HF, SSB, transceiver. Frequency range 2-30 Mhz. 28000 possible channels in 1 Hz steps. Transmits HI Power 20 Watts, LO 6 Watts. Power Supply 14.5 Volt from Nicad battery's. This particular set is made later in the war and is dated 1943 and is in very nice untested condition. Six channel, 47-55.4 MHz, FM, Walkie-Talkie, 500 MW output, crystal controlled. Supplied with Antenna but no crystals. The crystals may be available separately, please enquire.